So…. Apple Butter is one of my most favorite foods EVER! 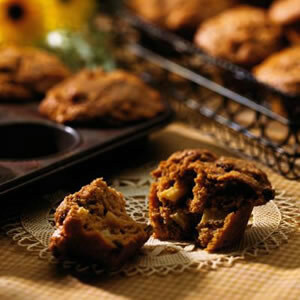 Make these delicious muffins and you’ll have a great addition to your Sunday morning brunch! Preheat oven to 375 degrees F. Coat 12 standard 2 1/2-inch muffin cups with cooking spray. Place raisins in a small bowl and cover with hot water. Set aside. Whisk egg, milk, apple butter, brown sugar, oil and molasses in a large bowl until blended. Make a well in the dry ingredients and pour in the wet ingredients. Drain the raisins; add them and the diced apple to the bowl. Stir until just combined. Scoop the batter into the prepared pan (the cups will be very full). Tip: Wrap leftover muffins individually in plastic wrap, place in a plastic storage container or ziplock bag and freeze for up to 1 month. To thaw, remove plastic wrap, wrap in a paper towel and microwave on Defrost for about 2 minutes. PER SERVING: 197 cal., 6 g total fat (1 g sat. fat), 18 mg chol., 148 mg sodium, 38 g carb. (4 g fiber), 4 g pro.